SLD have been working within the Petrochemical Industry since their formation over 40 years ago. You will find SLD working alongside Project Engineers and Contractors solving a wide range of problems within today’s complex Petrochemical Plants. SLD provide Pumping and Power solutions from small stand alone projects, such as tank cleaning and testing to complex shut down projects for fire mains and line cleaning. SLD work with Engineers to overcome a wide range of day-to-day problem solving and with Project Management Teams to provide turnkey installation and operation solutions from concept to provision. 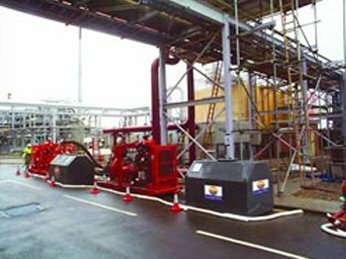 The Hire and Sale range specification of the SLD portfolio ensures equipment not only meets your Pumping and Power Generation requirements but will do so meeting exacting standards in PetroChemical sites in environmental, health and safety and provide market leading economies of use. Equipment can be provided with Chalwyn Valves and Spark Arrestors and enhanced electrical system safety as required. SLD’s continually driven HSE policies and training will also ensure that personnel visiting and operating on your locations will be highly safety conscious and equipped and trained to work safely and efficiently in today’s complex plants. Safety Passports and additional college training and attention to detail for on-site training inductions ensure our people operate safely at all times.